For Presidents’ Day, in honor of the lore involving George Washington and the cherry tree, here’s an ax project. It’s easy; no lie. What You Need: 1 Popsicle stick (craft stick); yellow construction paper; glue or tape; scissors; black crayon or marker. 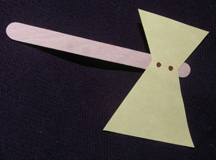 How to Make It: Pre-cut or trace ax head shape on yellow construction paper. Kids simply glue or tape middle of ax head to one end of craft stick and (optional) add 2 black dots to simulate screws. This entry was posted on Sunday, February 17th, 2008 at 9:23 pm	and is filed under Popsicle stick crafts, Presidents' Day crafts. You can follow any responses to this entry through the RSS 2.0 feed. Responses are currently closed, but you can trackback from your own site.